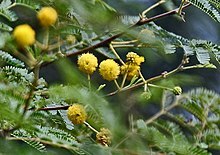 Vachellia nilotica (commonly known as gum arabic tree, babul, thorn mimosa, Egyptian acacia or thorny acacia) is a tree in the family Fabaceae. It is native to Africa, the Middle East and the Indian subcontinent. It is also a Weed of National Significance and is an invasive species of significant concern in Australia. Vachellia nilotica subsp. adstringens (Schumach. & Thonn.) Kyal. & Boatwr. Vachellia nilotica subsp. indica (Benth.) Kyal. & Boatwr. Vachellia nilotica subsp. kraussiana (Benth.) Kyal. & Boatwr. Vachellia nilotica subsp. leiocarpa (Brenan) Kyal. & Boatwr. Vachellia nilotica subsp. nilotica (L.) P.J.H.Hurter & Mabb. Vachellia nilotica subsp. subalata (Vatke) Kyal. & Boatwr. Vachellia nilotica subsp. tomentosa (Benth.) Kyal. & Boatwr. This tree was originally the type species of the genus Acacia, which derives its name from Ancient Greek: ἀκακία, akakía, the name given by early Greek botanist-physician Pedanius Dioscorides (ca. 40–90) to this tree as a medicinal, in his book Materia Medica. The renaming of the genus to Vachellia remains controversial. The genus name Acacia derives from the Ancient Greek word for its characteristic thorns, ἄκις, ákis, "thorn". The species name nilotica was given by Linnaeus from this tree's best-known range along the Nile river. The plant V. nilotica then, in turn, became the type species for the Linnaean genus Acacia (not all of which have thorns, even though they are named for them). For the ongoing reclassification of this and other species historically classified under genus Acacia, see the Acacia. Vachellia nilotica is a tree 5–20 m high with a dense spheric crown, stems and branches usually dark to black coloured, fissured bark, grey-pinkish slash, exuding a reddish low quality gum. The tree has thin, straight, light, grey spines in axillary pairs, usually in 3 to 12 pairs, 5 to 7.5 cm (3 in) long in young trees, mature trees commonly without thorns. The leaves are bipinnate, with 3–6 pairs of pinnulae and 10–30 pairs of leaflets each, tomentose, rachis with a gland at the bottom of the last pair of pinnulae. Flowers in globulous heads 1.2–1.5 cm in diameter of a bright golden-yellow color, set up either axillary or whorly on peduncles 2–3 cm long located at the end of the branches. Pods are strongly constricted, hairy, white-grey, thick and softly tomentose. Its seeds number approximately 8000/kg. Vachellia nilotica is native from Egypt, across the Maghreb and Sahel, south to Mozambique and KwaZulu-Natal, South Africa, and east through Arabian Peninsula to Indian Subcontinent subcontinent and Burma. It has become widely naturalised outside its native range including Zanzibar and Australia. Vachellia nilotica is spread by livestock. In part of its range smallstock consume the pods and leaves, but elsewhere it is also very popular with cattle. Pods are used as a supplement to poultry rations in India. Dried pods are particularly sought out by animals on rangelands. In India branches are commonly lopped for fodder. Pods are best fed dry as a supplement, not as a green fodder. In West Africa, the pods and leaves are considered to have anthelminthic properties on small ruminants and this has been confirmed by in vitro experiments on nematodes. The tender twig of this plant is used as a toothbrush in south-east Africa, Indian subcontinent. The exudate gum of this tree is known as gum arabic and has been collected from the pharaonic times for the manufacture of medicines, dyes and paints. In the present commercial market, gum arabic is defined as the dried exudate from the trunks and branches of Senegalia (Acacia) senegal or Vachellia (Acacia) seyal in the family Leguminosae (Fabaceae). :4 The gum of A. nilotica is also referred to in India as Amaravati gum. V. nilotica makes a good protective hedge because of its thorns. The tree's wood is "very durable if water-seasoned" and its uses include tool handles and lumber for boats. The wood has a density of about 1170 kg/m3. ^ Kyalangalilwa B, Boatwright JS, Daru BH, Maurin O, van der Bank M (2013). "Phylogenetic position and revised classification of Acacia s.l. (Fabaceae: Mimosoideae) in Africa, including new combinations in Vachellia and Senegalia". Bot J Linn Soc. 172 (4): 500–523. doi:10.1111/boj.12047. ^ a b Wickens, G.E. (1995). "Table 2.1.2 The timber properties of Acacia species and their uses". Role of Acacia species in the rural economy of dry Africa and the Near East. FAO Conservation Guide. 27. Food and Agriculture Organization of the United Nations. ISBN 978-92-5-103651-8. ^ "Acacia nilotica". Germplasm Resources Information Network (GRIN). Agricultural Research Service (ARS), United States Department of Agriculture (USDA). Retrieved 12 December 2017. ^ "Acacia nilotica". LegumeWeb. International Legume Database & Information Service. ^ "Vachellia nilotica (as Acacia nilotica)". Integrated Taxonomic Information System. ^ "Definition of BABUL". www.merriam-webster.com. Retrieved 2017-08-03. ^ "Vachellia nilotica". Germplasm Resources Information Network (GRIN). Agricultural Research Service (ARS), United States Department of Agriculture (USDA). Retrieved 30 June 2017. ^ "Acacia nilotica (acacia)". Plants & Fungi. Royal Botanic Gardens, Kew. Archived from the original on 12 January 2010. Retrieved 28 January 2010. ^ Kull, Christian A.; Rangan, Haripriya. "Science, sentiment and territorial chauvinism in the acacia name change debate" (PDF). In Haberle, Simon P.; David, Bruno. Peopled Landscapes: Archaeological and Biogeographic Approaches to Landscapes. Terra Australis. 34. ^ Quattrocchi, Umberto (2000). CRC World Dictionary of Plant Names. 1 A-C. CRC Press. p. 6. ISBN 978-0-8493-2675-2. ^ "handbook on seeds of dry-zone acacias". www.fao.org. Retrieved 2017-08-03. ^ a b Prickly acacia – Acacia nilotica (PDF). Weed Management Guide. Weeds of National Significance. 2003. ISBN 978-1-920932-14-5. ^ a b Zabré, Geneviève; Kaboré, Adama; Bayala, Balé; Katiki, Luciana M.; Costa-Júnior, Lívio Martins; Tamboura, Hamidou H.; Belem, Adrien M.G. ; Abdalla, Adibe L.; Niderkorn, Vincent; Hoste, Hervé; Louvandini, Helder (2017). "Comparison of the in vitro anthelmintic effects of Acacia nilotica and Acacia raddiana". Parasite. 24: 44. doi:10.1051/parasite/2017044. PMC 5703060. PMID 29173278. ^ "Production and marketing of gum arabic" (PDF). Nairobi, Kenya: Network for Natural Gums and Resins in Africa (NGARA). 2004. ^ "Acacia nilotica (gum arabic tree)". Invasive species compendium. Centre for Agriculture and Biosciences International. Retrieved 24 January 2016. ^ a b Mueller, Ferdinand (1884). "Acacia longifolia, Willdenow". Select extra-tropical plants readily eligible for industrial culture or naturalization. G.S. Davis. p. 7. ^ "Vachellia nilotica (as Acacia nilotica)". Tropical Forages. Wikimedia Commons has media related to Vachellia nilotica. Carter, J.O. (1998). "7.2 Acacia nilotica: a Tree Legume out of Control". In Gutteridge, Ross C.; Shelton, H. Max. Forage Tree Legumes in Tropical Agriculture. The Tropical Grassland Society of Australia. ISBN 978-0-9585677-1-8. "Vachellia nilotica (as Acacia nilotica subsp. indica (Benth.) Brenan)". FloraBase the West Australian Flora. Acacia nilotica in West African plants – A Photo Guide.